On 26th March 2016 Julie-ann Macleod of Norwest Sea Kayaking contacted Assynt Field Club to say, while out with clients, she had come across a freshly dead Harbour Porpoise near Oldany jetty. Two members of the Field Club have been trained and certificated by the Scottish Marine Animal Stranding Scheme (SMASS) to safely and accurately collect data and samples from dead stranded marine animals. The samples to be collected are of skin, blubber, muscle and teeth. The SMASS project provides a systematic and coordinated approach to the surveillance of marine animal strandings in the UK and to the investigation of causes of death. The SMASS were contacted and they gave the go ahead for samples to be taken and issued the appropriate case number. The samples were obtained from this male porpoise on the 28th and arrived safely at the SMASS lab in Inverness the following day. 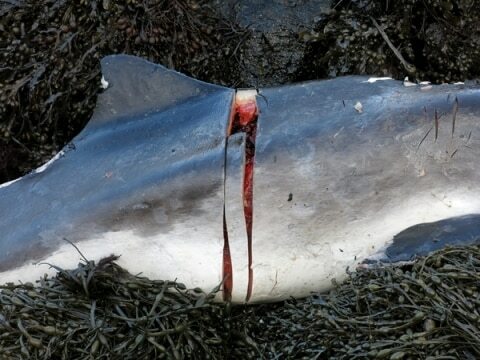 The remains of the porpoise were too badly scavenged to asses a possible cause of death but the samples submitted will be analysed to determine levels of heavy metals and PCBs, the latter of which collect in body fat and are ‘magnified’ up the food web. If you find a DEAD, stranded marine animal please call SMASS on 01463 243030 or 07979 245893. Rescue for LIVE strandings can be called 24 hours a day through: Scottish SPCA Animal Helpline (03000 999 999) or British Divers Marine Life Rescue (01825 765546). 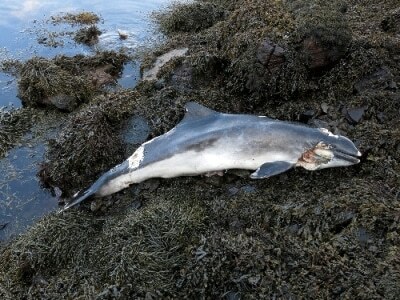 Several cetacean species have stranded around the coast of Assynt in the past including Harbour Porpoise, Common Dolphin, White-beaked Dolphin, Sperm Whale and Fin Whale. Please DO NOT TOUCH any dead or live stranded marine animal as they can carry diseases which can be transmitted to humans.